Funding for All’s comprehensive Funding Guide is the essential toolkit for all small to medium charities, voluntary and community groups and social enterprises. As the competition for funds increases, opportunities decrease and statutory funding changes to commissioning, it is essential for local groups/organisations to develop a variety of fundraising skills in order to secure funding. Our guide, written by industry experts, aims to help and assist organisations who are new and inexperienced fundraisers. It is to help you to develop a positive attitude to fundraising, with the right knowledge, approach and support. What’s included in the Funding Guide? 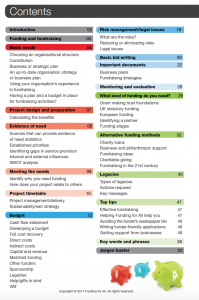 Buy your Funding Guide today for just £14.95 (inc. P&P).